What if Othello were to come on Oprah? She would probably ask him about his childhood, growing up as a “moor” in a predominantly Christian world. Dr. Phil would chime in about how he was bullied as a child, always separate, always obsessed about becoming “like the others” but at the same time feeling somewhat “lesser” because he is in the minority. Iago, a man with his own complexes, would play on those feelings, enhance them, leading Othello (the play) to the tragic end we are all quite familiar with. As if Othello on Oprah wasn’t bizarre enough, now try and transplant Othello to India, to Bollywood. How does one do that without avoiding the obvious absurdities associated with this transition? Well, just ask Vishal Bhardwaj, the director of Omkara, who’s done just that. This is not the first time Bhardwaj has taken the Bard to his homeland. He did it first in Maqbool, an excellent adaptation of Macbeth, and its overt themes of lust for power and betrayal adapted to Bombay’s complicated and glamorous underworld. With Omkara, he alters Othello and the inherent insecurity and paranoia of its leading characters, to create a stylized Bollywood drama, songs and all. A few states in India’s north are dirt-poor and completely lawless. Although on paper there is a government, it is almost a joke, since most of the villages are run by gangsters. The only time the government does indeed have any power is when it consists of the local hoodlums (which is quite often). Because of the poverty and illiteracy in those areas, the region is overrun by largely medieval beliefs. This is where India’s notorious caste system still holds some sway. It is in one of these states, Uttar Pradesh (also Bhardwaj’s hometown) that Omkara is set. The movie tells the story of a half-caste gangster (Omkara/Othello), played by Ajay Devgun, who makes it big to become leader of the gangs in his district, comprising of a number of villages. He ends up marrying a rich woman (Dolly/Desdemona), played by Kareena Kapoor, from a respectable high-caste family that opposes the match. Early on in the film, Dolly’s father warns Omkara or Omi, “Jo ladki apne baap ko thag sakti hai, wo kisi aur ki sagi kya hogi” (‘She has deciev’d her father, and may thee’). This line reverberates in Omi’s head. The hierarchy of hoodlums has the local politico (Bhaisaab/Duke of Venice), played excellently by Naseeruddin Shah, on top. Right under him is Omi. When Bhaisaab, literally ‘elder brother,’ wins the local elections and comes into power, Omi must choose a henchman. He chooses Keshu/Cassio (Vivek Oberoi), overlooking his longtime aide and brother-in-law, Langda Tyagi/Iago (Saif Ali Khan). Wracked with envy, Langda, literally ‘lame one,’ plays on Omi’s insecurities to destroy Keshu’s reputation, Omi’s marriage and, eventually, Omi himself. For his underhanded schemes, he enlists Raju/Rodrigo (Deepak Dobriyal), who was jilted at the altar by Dolly, as well as Omi’s sister Indu/Emilia (Konkona Sen Sharma), who helps him unknowingly. Watched alone, the movie makes for excellent viewing. However, just as it is impossible to prevent yourself from comparing siblings when you meet them, it is impossible to review Omkara without comparing it to Maqbool. This is, unfortunately, where Omkara falls short. While Maqbool was phenomenal in direction and acting, it is sad to say that, Omkara, while very well-directed, is comparatively much more insipid as far as the acting is concerned. The cast of leading characters in this movie is from the top tier of Bollywood stars and perhaps this is why the movie fails. They lack the requisite versatility and depth to make the Shakespearean drama enticing. The best acting comes from Shah and Dobriyal, who are in the smaller roles, and while the former is a big name on the arthouse scene in India, the latter is lesser-known. While trying to fuse arthouse with Bollywood, Bhardwaj ends up having the film become neither. To misquote another great writer, “Oh, Arthouse is Arthouse, and Bollywood is Bollywood, and never the twain shall meet.” Despite this though, the soundtrack is fantastic since Bhardwaj was, before his movie debut, a highly competent music director. Although it comes highly recommended for watching, it is disappointing when compared with Maqbool. Sholay, on the other hand, is unabashedly Bollywood. The creators of this film had no grand ideas of fusing arthouse and Bollywood. They just wanted to make a lucrative and successful film. 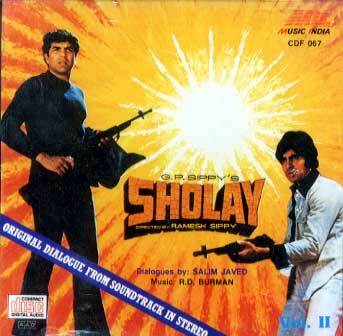 Sholay is the highest grossing and most profitable Hindi movie ever made. It ran to packed houses continuously for five years at a cinema in Bombay and several others across India. If you ever wish to befriend an Indian, it is recommended you bring up this film, and they will be able to quote its dialogue verbatim, over thirty years after its original release. It changed the face of Bollywood and, arguably, was responsible for creating the phenomenon that was Bollywood through the late 1970s up to the 1980s. The movie is essentially a “curry Western” – a mixture of a spaghetti western along the lines of Sergio Leone and a regular western along the lines of Sam Peckinpah, made specifically to entertain Indian audiences. It’s somewhat of a remake of Sturges’ The Magnificent Seven (1960) for Indians, as much as that movie is a remake of Kurosawa’s The Seven Samurai (1954) for Americans. The difference is that it only has two protagonists. It has all of the requisite songs (five, to be precise) interspersed into the film, composed by Bollywood legend R.D. Burman. It was the breakthrough film for Bollywood superstar (and recent recipient of France’s highest civilian honor, Officier de la Legion d’Honneur) Amitabh Bachhan and launched his career. It also starred Amjad Khan as the indomitable Gabbar Singh, a villain that affected the Indian psyche to such an extent that even today, parents will grin with pride when their toddlers recite his lines. The movie also featured Bollywood stars Dharmendra, as the romantic lead, Hema Malini, as his love interest, Jaya Badhuri, as the thakur’s daughter-in-law, and the wonderful Sanjeev Kumar, as the thakur (landowner) and former police officer. It turned out that both Dharmendra and Amitabh married their leading ladies in real life. The plot is simple. Veeru (Dharmendra) and Jai (Bachhan) are two small-time, lovable cons. Their friendship is of Bollywood (read: mythical) proportions which makes them even more endearing. Meanwhile, Gabbar Singh (Khan) has kidnapped and killed most of Thakur Baldev Singh’s (Kumar) family, and scarred the Thakur, both physically and mentally, for life. Since Veeru and Jai are known to do anything for the right compensation, they are recruited by the Thakur to “take care” of Gabbar. Although usually landowners in Hindi movies are usually evil powermongers, in this case the Thakur is a good man, and just. As they proceed with their pursuit of Gabbar, they both meet their respective love interests and ultimately, of course, win them over. What is most interesting about this movie is the phenomenon that it became. The movie itself is not spectacular from the perspective of film as art. It is certainly entertaining with a great soundtrack (at least, from an Indian standpoint - the average Westerner may not see the appeal). The acting is good, but not great and the direction is stylized and over-dramatized at times – almost a parody of the spaghetti westerns themselves. In fact, when it was released on the 15th of August, 1975 (also India’s Independence Day) it received lackluster reviews and mediocre attendance. It was weeks after the bad reviews that the movie halls started filling up and shows started to get sold out. Scalpers started selling tickets at outrageously high prices. Lines extended up to a mile outside the theatres, even in heavy monsoon rains. People went to see the movie again and again and they would quote the dialogue simultaneously with the movie, with some even mimicking the sound effects. Although it is no longer shown in cinemas, it was shown for the first-time on public television in 1996. The streets of every city in India were virtually empty that day. So what makes this movie so great? To the average Westerner, it might be a complete mystery. In spite of growing up in Bombay, surrounded by people quoting the movie’s dialogues, and having seen it several times, I cannot purport to provide any insight to answer that question. However, if one movie could unite a country with as many opinions as there are people and around 21 official languages (at last count), there might just be something to it. Perhaps I need to watch it just one more time, just to make sure.